One of Sam’s Town Hotel & Gambling Hall’s most famous attractions is Mystic Falls indoor park. This area transforms into a winter wonderland during the holidays. So, even if you aren’t able to enjoy snowy, winter weather in Las Vegas most of the time, you can enjoy it right here while you pay a visit to Santa. Santa makes a daily appearance until December 20th. He is available on Thursdays and Fridays from 4 p.m. until 8 p.m., and 12 p.m. to 8 p.m. during Saturdays and Sundays. There is no cost to see Santa, and the experience is open to all ages. To visit him at Sam’s Town Hotel & Gambling Hall, travel to 5111 Boulder Highway, Las Vegas, NV 89122. To speak to an employee, call (702) 456-7777, or visit their website. 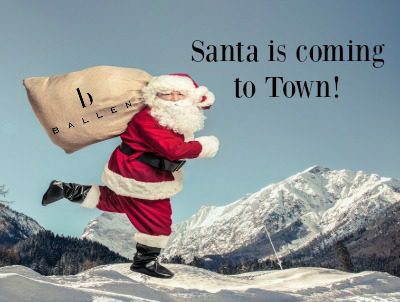 The Ballen Group Las Vegas is pleased to bring you information about coming events and interesting places to visit in Las Vegas and Henderson. Keep us in mind for all of your real estate needs. Interested in buying or selling a home in Las Vegas or Henderson? Give us a call at 800-805-8354. Let us WOW you!